We can't wait for this year's Cardiff Dog Days of Summer on August 12th and are so excited to feature local artisan's showcasing their beautiful wares in the spacial Maker's Market Corridor! Read below to find out what interesting and unique maker's will be featured at this year's event. Hound Made sells handmade gifts for dogs & dog lovers, including natural grooming products, dog themed art works, custom pet paintings & greeting cards. Currently sold mainly through Etsy they will be coming to local San Diego farmers markets soon! Everything is made by hand from start to finish by local owner, Abigail Rowlands. The grooming products are unique in that they are designed with natural ingredients and even include doggy bath bombs! Hound Made is excited to be seeing all of the adorable dogs, of course! Abigail is looking forward to meeting everyone and their fur babies at the Cardiff Dog Days of Summer event! She says to make sure and stop by booth A15 to say hi for some photo opts and goodies! Business Name: Gracie's "A Little Slice of Heaven"
Cardiff-by-the-Sea local, Gracie Howard, is a recent 11 year old two time Master Chef Junior Contestant and has taken that talent to create her own bake stand. She also donates a large portion or ALL of her proceeds to various organizations and/or customer selected charities. The name of the business is two fold according to Gracie. She hopes that her customers think her baked goods taste like "a little bite of heaven" and also that she is trying to do something "heavenly" or good for others (people and animals) "Always love your animals like they love you and have a great day because this is going to be great!!!!" Gracie is excited to see the dogs enjoy her homemade treats! "Seeing all of the dogs and knowing that the money I make is going to help them! I might even take home another rescue myself!" Bring your dog to Gracie’s “A Little Slice of Heaven” booth D14 to have some delicious treats! Cardiff-by-the-Sea local, Joanne Barratt has been a professional photographer for over 15 years. She is skilled at capturing the spirit and style of subjects ranging from newborns to families to corporate headshots and products. Joanne works closely with all of her clients to get the perfect photo that they want. Joanne is excited to see all of the dogs at the event and get some photo inspiration. Come by the Island Style Images booth A11 & 12 to check the business out! 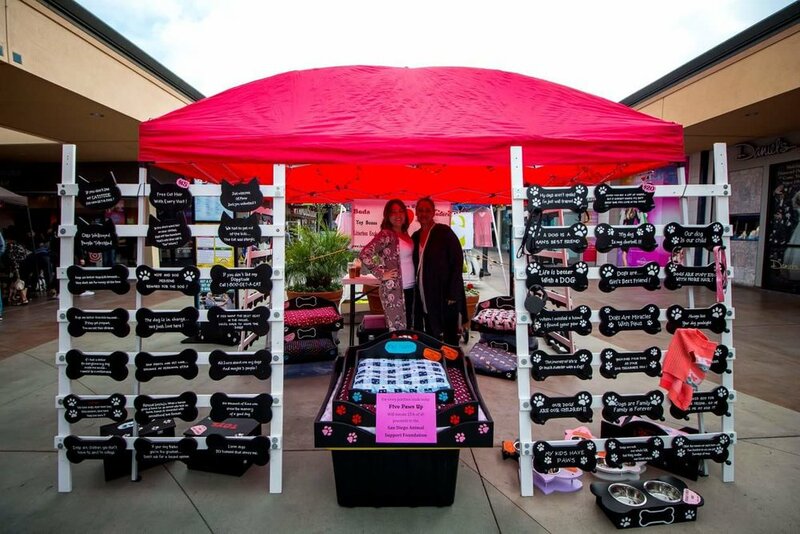 Located in El Cajon, Sheila Woodland, creates custom handmade dog beds, feeders, toy boxes, novelty signs, key holders, leash holders and yard signs. Sheila’s Boxes & Five Paws Up is unique because all of their products are custom created, hand painted with love and 100% made by females, making each of them individual. 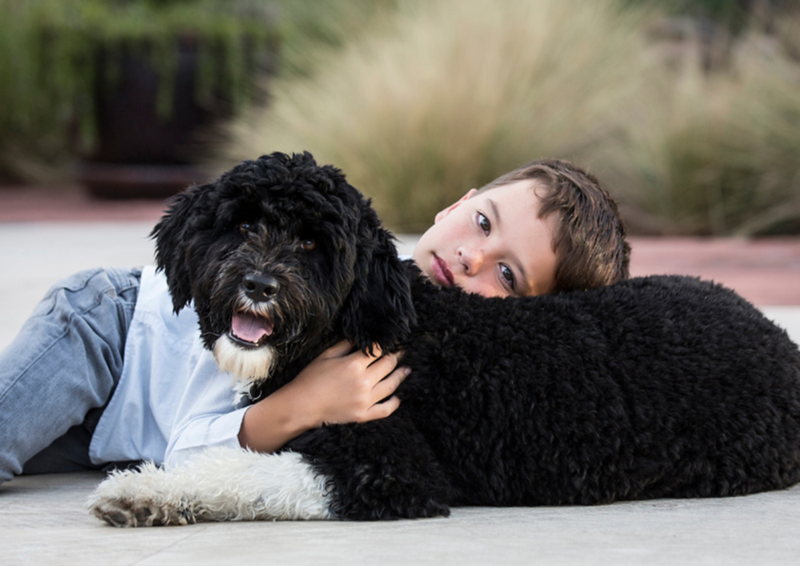 This family owned business has an immense love for their five rescue animals. We are excited to meet all the people in the community, fellow vendors and make some new doggie friends! We love to spoil our four legged family members and we would love to spoil yours! Come check out their booth B15 to see their unique products! Owner/Artist Nina Lutz creates et caricatures, pet portraits, pet illustrations and customized pet stationary. Nina’s artwork is unique because it brings together her love for dogs as well as her love for art and being an illustrator. Her own rescue pup, Rosie, inspires her. Nina is excited to show off her illustrations and charactures, as well as to be inspired by all of the dogs at the event. Visit Nina’s booth D12 to check out her amazing artwork! Cardiff local, Julie Ellis makers high quality and long lasting bags. Rais Case is unique because they truly look out for the environment by using circular design practices, utilizing 100% waste, using localized family owned manufacturing, and taking a close examination of every single part of their supply chain. Their products are sold at a retail/studio in Oceanside, where a DIY table is also featured. At the DIY table, customers can repurpose their old leather products into new crafts. Rais Case is excited to show attendees their beautiful products and make some new doggie friends. Come to the Rais Case booth A14 to check out their amazing bags and support a local, environmentally conscious company. What makes your business unique? CaliSoul is an artist owned lifestyle brand that promotes the best of California living with your friends, family & dogs. The brand is also family owned and all the art on their products is original and hand drawn. Hailing from Sacramento, CaliSoul owners, Alex & Kacy have never been to Encinitas, and they are excited to share our brand with new customers. 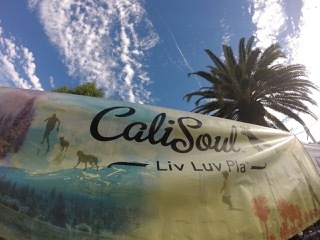 CaliSoul’s brand motto is… LIV, LUV, PLA. LIV everyday to the fullest. LUV with all your heart. PLA as hard, as you work. Come say hi and check out their unique clothing at booth G13. Older PostGet a Taste of the Food and Drink Vendors!